Until recently Ardbrecknish House was described as an “early 17th century Tower House”, presumably based on the title deeds which show 1633 as the date of the first change of ownership. There are however earlier records, not in the deeds that one Duncan McArthur, feur of Ardbrecknish, gave a charter of the land to the rector of Lochawe in 1618. Further research in the Edinburgh University archive, by the present owners, revealed a map by Pont, dated 1590, where the West Tower is clearly identified, located and sketched, as was Pont’s style. Architectural historians suggest that this saddleback tower and the wall thickness indicate mediaeval (15th century) origin. Whatever the date on which we continue to work the undisputed fact is that Ardbrecknish House is the oldest surviving and still operational building around the shores of Loch Awe. It seems that the original West Tower was built as a “fortified house”, perhaps for the protection from or containment of troublesome clansmen! The first extension to the north of the West Tower completed the present three storey West Wing of the house in the 17th century. By the mid 19th century the West Tower and West Wing were let as a shooting lodge, a connection maintained to the present day with safe facilities for deer stalkers and Ardbrecknish Forest, which is no longer part of the property. Later extensions to the house eastwards were all completed by the mid-19th century, the most recent being the three storey tower, at the North East corner, which has a gabled saddleback summit, which is corbelled from the round at the second floor. This feature leads our guests to assume that it must be the oldest part of the property. 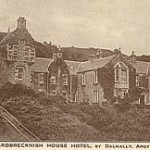 The house and the home farm, Rockhill (the English translation of Ardbrecknish ), remained as one unit, until the house was converted into a hotel in 1930 and sold in 1937. Ardbrecknish House today stands in 10 acres of woodland garden, together with the original one acre walled garden on the shore of Loch Awe, and the jetty where steamers delivered coal and other consumables for the estate. Inevitably a house of such antiquity is steeped in traditions, mostly maintained by word of mouth. 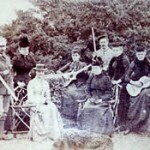 Ghost stories abound, whilst all relate the friendly character of their subjects. 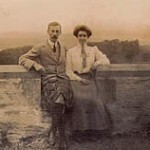 There were “the hounds of the Macdougall”, two large bloodhounds which “rose from the hearth, stretched and trotted out through the closed window, in the kitchen of West Tower. An elderly lady, a most diligent head housekeeper, is said to rise late at night to check that the laundry stored in the east wing is all prepared for the morrow. Her flickering candle may be glimpsed on such occasions, through the gaps beneath closed bedroom doors. In more recent times a team of craftsmen, engaged for an internal structural project, were summoned by a cry of “tea up”, only to find that no-one had made the brew and indeed no-one had uttered the call. Whilst the team waited for the kettle to boil and contemplated the mysterious summons, the internal wall on which they had been working, collapsed without warning.